Isabelle Borg with her famous painting Lovers in the Bull (1983). Painter Isabelle Borg, who was known for her bold and expressive works, passed away yesterday aged 51. The artistic community mourned the loss of the London-born artist who died after battling a degenerative lung disease which confined her to her Floriana home. “The greatest thing I admired about Isabelle’s talent and personality was her boldness. 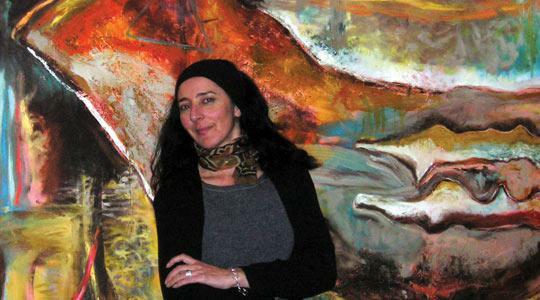 As a painter, her stunningly bold style made her one of Malta’s greatest successful contemporary artists... she transmitted her own very daring and particular perception of her subjects, which put her in a class of her very own,” her friend and colleague, Vicki Ann Cremona, says in an obituary today (see page 41). Ms Borg studied painting at the Camberwell School of Art, London, and, after obtaining her Masters, she became a lecturer at the University of Malta and the Junior College. Apart from the various exhibitions of her works, she also contributed to local art literature through various publications. “Without any doubt, Borg has given an excellent contribution to art in Malta. She was also a person who helped many appreciate art, not least her many students who remember the enthusiasm with which she talked about the subject that was her life,” the National Book Council said in a statement. Known by friends for her “cheerful character” and passion for life and justice, she set up the Moviment Mara Maltija (Maltese women’s movement) in the late 1980s, to speak out against injustice. Just a few months ago she was protesting against a Floriana development, located next door to her home. She lodged a complaint about the demolition of the historical building which will now be replaced with a block of apartments. The permit was issued even through the building’s heritage value had not been assessed. She was also concerned that the construction would affect her health since her lung disease could be exacerbated by the dust and pollutants that resulted from demolition, excavation and construction. Despite her disease, friends said she remained positive. “She was remarkably brave... and never lost her sense of humour throughout this ordeal,” her friend and fellow artist Madeleine Gera said. “Isabelle rejoiced in her painting... Let us remember Isabelle through her paintings,” she said, adding that Ms Borg’s partner, Graham Cooper, remained close to her throughout her illness.